Lupus , a chronic autoimmune disease, is typically thought to be a woman’s disease, but the fact is, men get lupus too. Although nearly ninety percent of those diagnosed with lupus are women between the ages of 15-45, men should not discount the potential that they too can have it or discount the seriousness of the disease and its effect on the body if left untreated. If you still are unconvinced that lupus is not just a women’s disease, here are a few numbers worth paying attention to: 1.5 million Americans have lupus, this means that approximately 150,000 men have lupus. That is nearly double the total number of people in the United States with muscular dystrophy (approximately 50,000 people have muscular dystrophy in the US) and cystic fibrosis (30,000 people have cystic fibrosis in the US) combined. 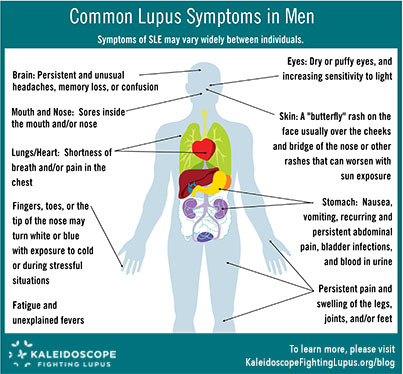 Not to dismiss the severity of those two diseases, but it is important to realize just how many men are affected by lupus. These are, indeed, staggering statistics that are difficult to ignore. Brain and Nervous System: Persistent and unusual headaches, memory loss, or confusion. Renal System: About half of systemic lupus erythematosus (SLE) patients will develop some form of kidney inflammation, called lupus nephritis. This inflammation can lead to kidney failure, but like most lupus symptoms, the effect on the kidneys is quite variable and hard to predict. Increased protein (showing as blood) in the urine, swelling of the feet and legs, and high blood pressure can be indicators that the kidneys may be affected. Eyes: Lupus can damage nerves and blood vessels in the eye, leading to dry or puffy eyes, and increasing sensitivity to light. Skin: Lupus may cause skin rashes, and is known for its distinctive [“butterfly” rash] on the face usually over the cheeks and bridge of the nose. These rashes can be exacerbated by sun exposure (photo-sensitivity). You may also experience hives or sores which would also worsen with sun exposure. Sudden and unexplained hair loss could also signify lupus but is a symptom easily ignored by men who assume it may be a normal part of aging. Fingers, Toes, Tip of the Nose: If your fingers turn white or blue with exposure to cold or during stressful situations, it can be caused by a constricting of the small blood vessels in those areas. This is called Raynaud’s phenomenon or Raynaud’s Syndrome, a condition closely associated with lupus. Legs, Joints, and Feet: Persistent joint pain and swelling is a common lupus symptom. Legs and feet may also swell. These would be symptoms similar to those in rheumatoid arthritis (RA), a common overlap disease with lupus. Pleurisy: Inflammation of the sac around the lungs causing shortness of breath and pain in the lungs. Renal (kidney) disease, also known as lupus nephritis: Blood in the urine, swelling of the legs and feet, or high blood pressure can signal renal disease. Discoid lupus: Look for reddish, scaly skin, or other rashes that can worsen with sun exposure. Hemolytic Anemia: This is from the destruction of red blood cells and can cause symptoms like breath, dizziness, headache, coldness in your hands and feet, pale skin, and chest pain. Lupus anticoagulant: There may be no symptoms but blood clots in the legs or lungs or even stroke are possible. You know your body, you know what is normal and what is not. If you are a male, and are experiencing out of the normal fatigue, weakness, or lethargy, regularly find yourself taking an unusually high dosage of over-the-counter anti-inflammatory medications for muscle and joint pain (these can damage the liver with prolonged use), notice any strange rashes or having unusually high sensitivity to light, please take the time to consult a health care professional.